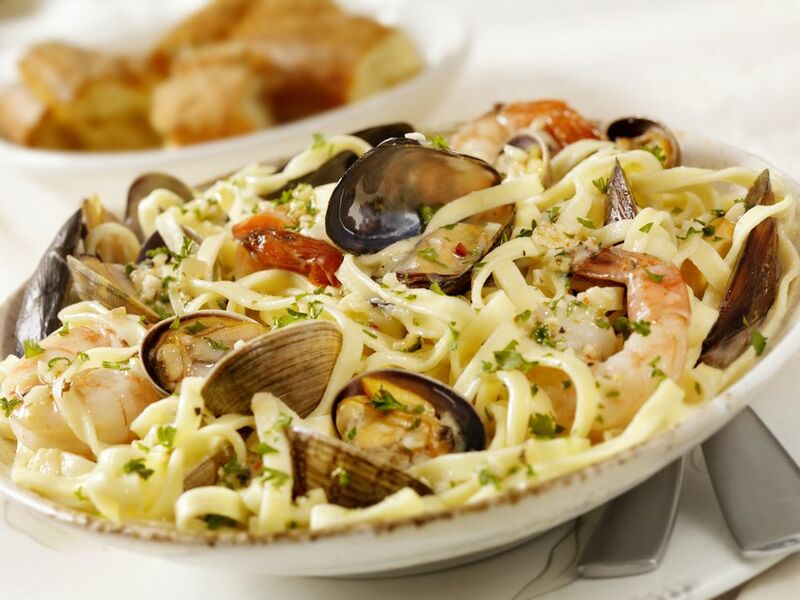 Shrimp, squid, mussels, and are simmered in a garlic tomato sauce and served over for an Italian seafood feast. Place shrimp, squid, mussels, and in 4 different bowls of cold water with a little coarse salt added to each, and soak for 30 minutes. Drain the shrimp and rinse under cold running water, then shell them. Place the shrimp in a small bowl; put the shells in a small saucepan. Pour the cups cold water over shells, place the saucepan over medium heat, and simmer for 30 minutes. Strain the broth (it should yield about 1 cup), discard the shells, and set aside until needed. Coarsely chop the garlic on a board. Place a small saucepan with 1/4 cup of the olive oil over medium heat. When the oil is warm, add the garlic, saute for 2 minutes, then add the tomatoes. Simmer for 30 minutes, seasoning to taste with salt and pepper. Pass the contents of the saucepan through a food mill, using the disc with smallest holes, into a flameproof casserole. Set casserole over low heat to reduce liquid for 15 minutes. Meanwhile, drain the squid and rinse under cold running water. Place another medium-sized saucepan with 1/4 cup of oil over low heat. When the oil is warm, add the squid and saute for 5 minutes. Season with salt and pepper, and keep adding the shrimp broth until the squid is tender, for 10 to 20 minutes, depending on the size of the squid. Add the shrimp to the pan with the squid and cook for 3 minutes. When the pasta is ready, drain it, transfer to the skillet with the mussels and clams, add the tomato sauce with the shrimp and squid, then mix very well and let cook for 1 minute more to all the pasta to absorb some of the sauce. Transfer to a warmed serving platter, sprinkle the whole parsley leaves over and serve.